Can you name the highest peaks in the Madison Range? You'll be able to after you read this post! Big Sky, Montana is nestled in the middle of the Madison Range. Named after President James Madison, the Madison Range is on the western edge of the Greater Yellowstone Ecosystem. The Madison River stretches from I-90 in the north to West Yellowstone in the south. It is confined by the Madison River on the west and the Gallatin River on the east. This remote mountain range stretches roughly 80 miles north to south and 25 miles east to west. 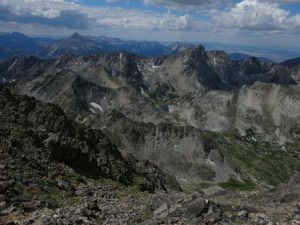 The Madison Range is located in both the Beaverhead-Deerlodge and Gallatin National Forests. 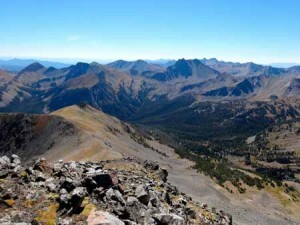 It is home to the Lee Metcalf Wilderness which covers 242,068 acres and contains four wilderness units: Bear Trap Canyon, Spanish Peaks, Taylor-Hilgard, and Monument Mountains. It's wild and remote country that is filled with hiking, climbing, backpacking, and peak bagging potential. Mountain peaks surround Big Sky and beckon adventurers to climb them. They offer stunning 360 degree views of Big Sky country and the surrounding peaks. Whenever we reach a summit in the mountains, we like to identify the highest peaks in the Madison Range because it makes it easier to plan our next adventure. 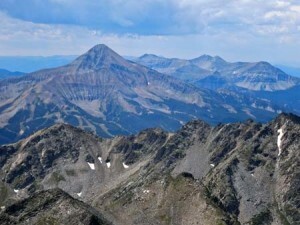 This unofficial list focuses on the named peaks in the Madison Range near Big Sky. It does not include unnamed peaks that are only designated by an elevation on different maps. One of the best overview maps of the Big Sky area is produced by Beartooth Publishing. Pick up a copy today! Use this unofficial list of the highest peaks in the Madison Range as a fun way to impress your friends over Montana Beers or as a tick list for your climbing adventures. Be safe out there and we'll see you on the summit!